We’ve all seen cartoons of the sage who sits on a remote mountaintop, and the supplicant who, after a terrible struggle, manages to reach the top. For I am come to set a man at variance against his father, and the daughter against her mother, and the daughter-in-law against her mother-in-law. And a man’s foes shall be they of his own household. It’s a very fierce description of what God needs us to give Him, before He can free us completely. Jesus was speaking from a perspective that is absolutely chilling to us, of complete and uncompromising renunciation of this world. And there is no possible way we can twist those words into something more palatable and comforting. Swami talked about how people would understand Paramhansa Yogananda very differently, according to their own limited capacity to perceive him as he truly was. 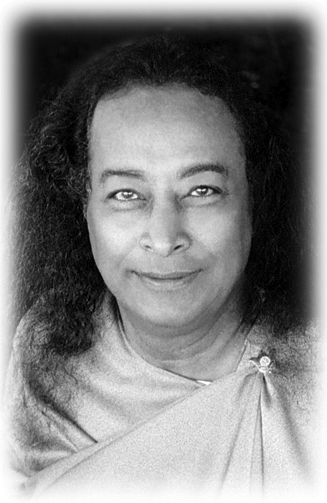 Swami said that he hadn’t known how he could put that aspect of Yogananda into The Path, in a way that people would understand it properly, in the context of his role as a great avatar – an incarnation of God. In the same conversation, he spoke of how the avatars will always bring a number of their advanced disciples with them, to give them a chance to work out their karma and become like him, by helping him with his mission. A great master’s consciousness is much freer than that of the semi-realized yogi who sits in solitary contemplation, working out his salvation in a Himalayan cave. An avatar comes with a tremendous, very public mission to change the direction of the entire planet, and it isn’t job that he can do by himself. The atmosphere of this world is not at all congenial for someone whose consciousness is fully spiritualized. In the higher ages, it’s somewhat more congenial, but Jesus’ mission brought him to this world during an age of the lowest consciousness, in descending Kali Yuga, when it was almost inevitable that the people of that time would reject and persecute him, and even kill him. 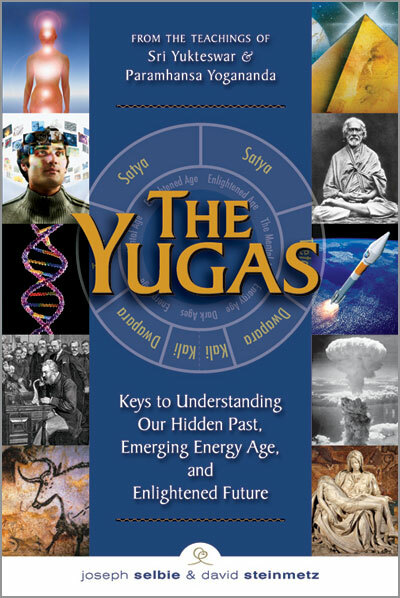 The Yugas. Click image to visit publisher’s page. Because Paramhansa Yogananda came at a time of slightly higher consciousness, at the start of Dwapara Yuga, the obstacles he faced were somewhat less severe. But, even so, he pointed out that he had to live through three wars. He remarked that Lahiri Mahasaya had had it somewhat easier, because there were no major wars during his lifetime. But for a soul whose consciousness is omnipresent, and who feels his oneness with every living being, it must be a great trial to come at a time of universal slaughter and strife. Master tells in Autobiography of a Yogi how Lahiri was meditating one day, and how he suddenly exclaimed, “I am drowning in the bodies of hundreds of people off the coast of Japan.” The next day, the newspapers reported that a ship had indeed gone down in the Sea of Japan. A master needs to have souls around him whose vibration is sympathetic and similar to his own, and who can support him in his mission because they understand what he’s trying to accomplish. When an avatar suffers in his body, it isn’t his own karma that he’s working out. Rather, he’s taking onto his own body some of the karma of his disciples. Master said that this is why Jesus let his body be crucified. People say that Jesus “died for our sins,” but this is very far from the truth of the matter. As Swami explained, Jesus used his physical body to help those close disciples who were with him, and to give them the strength that they would need when he was gone, as they began to spread his work. Yogananda used his physical body in the same way. At one point, when he appeared to be very ill, one of his close disciples, Ananda Mata, seeing that he was suffering, panicked and called the doctor. Master would consult doctors sometimes, but in this case he knew that it wasn’t a medical problem. Swamiji also went to doctors, because his body was very infirm, and it often threatened to prevent him from completing the work that Master had given him. After Ananda Mata called the doctor, Sister Gyanamata, Master’s most advanced female disciple, spoke to her very sternly. Among her other remarks, she said that it must be very lonely for the Master, when those disciples who are closest to him don’t understand. A master’s ability to take others’ karma onto his own body implies an amazing level of detachment and impersonal strength. It can serve us all as an example, of the difference between our ordinary, human emotional response to difficult situations, and the impersonal attitude of the masters which we, too, need to cultivate, if we want to move toward God. Swamiji said that willpower is the capacity to discriminate among different states of consciousness, and direct our awareness to the state of consciousness that will be most beneficial to us in the long run. This is essentially why a great many people cannot even come close to understanding the path of Self-realization, because it seems so completely contrary to how they understand where their happiness comes from. I’ve spoken on many occasions about the need to stop looking to this world for our satisfaction. And, very often, after I speak that way, I’ll get emails, or a tug on the sleeve, and people will present me with a list of all the many nice things there are in this world. But the deeper truth is that it isn’t a question of refusing to live actively in the world, or to acknowledge its undeniable beauties. We don’t need to turn a blind eye to the uplifting possibilities of this life. The challenge is to understand the attitudes that will be helpful to us if we’re looking for a much higher, eternal happiness that exists beyond this world. The simple fact is that we only ever really learn from our own experiences. And we will not be able to learn from the experiences of others until we are well and truly receptive and ready to hear what they have to say. His message was simple: know God and you will know that He is everywhere, in all paths. I was born into a comfortable situation, with a supportive family, yet from a very young age I was obsessed with an urgent need to discover what would make me happy. Now, you might think that if I was obsessed with finding happiness, I must have been pretty miserable. But in fact the exact opposite was true, because I was quite a cheerful little person. I believe there was a subtle karmic memory of other lives when I had looked for happiness and hadn’t found it. Paramhansa Yogananda used to say that God did a wonderful job when he created reincarnation. Because if this life were nothing but an absolute hell, we would very quickly want to get out of it. As Master put it, the trouble with this life is that it almost works. It holds out so much promise, yet it always falls just a little bit short of giving us what we want. If only I had married so-and-so. If only we had had children. If only our son hadn’t been such a pill. If only our investments had worked out. If only we had bought low and sold high. We are always thinking of what might have been, if it had turned out just a little bit better. And if you think about your own life, you’ll see that it has always been just almost okay. Master said that this is why we incarnate, because this world almost works. We keep coming back and trying to figure it out and trying one more time to organize it so that it will give us what we want. We pick a different set of parents – our mother will be Aunt Jane this time, instead of our mother in this life. And in the long run we have to squeeze the orange dry before we can understand that this world is always going to disappoint us. What eventually happens is that we reject the world not because it has let us down so many times, but because we realize that the one, consistent factor in our experience of the world is our own consciousness. I was driving back to the Bay Area from Ananda Village, late at night. It was two in the morning and there was little traffic, so I was changing lanes to avoid the bumps. And then a red light appeared behind me, and a policeman pulled me over and began questioning me: “What day of the week is it? Who is the president?” And it finally dawned on me to say, “Oh, no, officer, I haven’t been drinking.” We were able to straighten it out, but it hadn’t even crossed my mind that he thought I’d been drinking, because intoxication was so completely beyond the sphere of my consciousness. The one, consistent fact of our lives is our inner reality. It’s what we project onto this world – our hopes and dreams and expectations – and then we imagine that the world itself can fulfill us. We mistakenly think that we’re giving our enthusiasm to the world in response to a mysterious power that’s coming from the object of our enthusiasm. And because we are tricked into chasing after that imaginary source, we are forced to reincarnate, time after time, until we’ve learned the lesson. We are, very literally, the only source of our own happiness. I don’t mean this in an egoic way – that I’m in control, therefore I can get whatever I want, and when it get it I’ll be happy. The truth is that we are made of bliss, and when we are able to set aside all of the haunting desires that prevent us from perceiving our own true nature, we discover that we are nothing but bliss. We condition our happiness by the belief that we must be unhappy until we can achieve the objects of our desires. But the truth is that we are always abiding in bliss. And we deprive ourselves of that bliss by our confused belief that happiness can come by chasing after the shiny glow that we project onto this world. We are projecting our inner light onto a world of mirrors that reflect back to us our own light. We’ve wrapped the world in shiny tinfoil, not realizing that if we would stop craving the reflections, we would know the bliss that is inside us. Not only would that bliss be ours, but it would consume us, because it is what we are: ever-existing, ever-conscious, ever-new bliss. I was born with subtle memories of my past lives – samskars, as they’re called in India. I live with subtle memories of other lives when it didn’t work out for me. And it isn’t that it didn’t work out because it was horrible, but because it was never quite enough. Swamiji often said that we learn a certain amount from our disappointments, but we learn more from our fulfillments. As long as I’m imagining that I will be happy if I can just gain a little bit more, I will have an incentive to keep trying to get it. But if I can experience it, and understand by my own experience that it cannot give me what I want, I’ll be able to let it go. So long as we are depending on something other than the true source of our joys, we are terribly vulnerable. The trouble is that this world is ephemeral, and no matter how long we live, or how much we manage to acquire and hold onto, it will all sooner or later melt away. On the pilgrimages that we led to India, we would visit the holy city of Varanasi, and we would get up early to watch the sun rise over the Ganges and chant the Gayatri Mantra, and it was incredibly evocative of past lives. It was marvelous, and then we would go by boat to the burning ghats where people carry their dead relatives in litters through the streets and put them on a pile of wood and start the fire and stand around and watch the body burn. We would watch this scene from our tourist boat, with the bodies burning, and I realize how absurd it sounds, but I loved it, because it was so magnificently real – to see so vividly, before our eyes, that this is the reality behind all of the superficial games we play, pretending that this world can fulfill us. After leading the pilgrimages for a number of years, we got used to the extreme cultural differences, and we were comfortable going to the burning ghats. But many of the people in the boat had never been to India, and I remember how I had my back turned to the ghat as I handed out the breakfast boxes, and how I noticed a certain lack of enthusiasm among the people in our group for enjoying a hardboiled egg and toast while they watched the bodies burning. Because, of course, it was macabre, and when I looked over my shoulder I realized, “Oops, maybe this isn’t the perfect time for a picnic.” So we put the boxes aside and waited until later to have our breakfast. 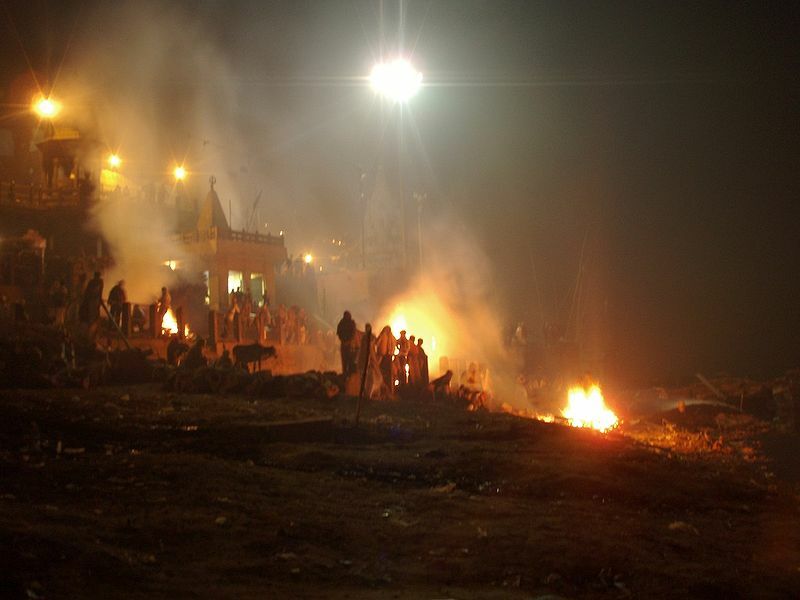 Photo: Burning ghats of Manikarnika, Varanasi. But, on the other hand, why not? Master says in Autobiography of a Yogi that yogis will often meditate in the cremation grounds. Sri Ramakrishna used to meditate all night in the cremation grounds, to immerse his consciousness in the awareness that death is no less beautiful than birth. Why should old age and the dissolution of these wonderful bodies be less desirable than to be young? I remember how Swamiji spoke to a group of young people at Ananda Village and said, “Enjoy those bodies while they’re still working so well.” Because time will pass, and why is one time less beautiful than another? We’ve projected the unconditioned bliss of our souls, and we mistakenly think that the object that’s reflecting our bliss back to us is its source. It makes us terribly vulnerable, because we cannot control what’s going on outside of ourselves. What’s reflected back to us is ever changing, and therefore on some subtle inner level we are always afraid. Think of the toll it takes on us, when in the midst of the greatest happiness, we know that we won’t be able to make it last. So we have two choices. We can become world-weary and cynical, or we can emulate the saints. But that isn’t the answer, and it definitely isn’t what we see in the saints. What we see in the masters is a wild abandonment of joy, in their awareness that knows, “What do I have to be afraid of?” And it’s why the masters come to us, to show us the truth. Master had such a marvelous turn of phrase – he said, “You have within you a portable paradise.” I love that saying. I like to visualize myself as a well-designed little box that I can open, and inside is a portable paradise. Because isn’t that a true and wonderful image? If we have within us a portable paradise, what do we need to fear? If what’s coming back to me from the world is a beautiful, sweet, loving friendship amid the greatest physical beauty, I may think that I’ve found everything I’ve been seeking. But if what’s coming back to me is nothing but hard lessons and challenging times that are giving me the experiences I need to discover the portable paradise within me, am I not even more greatly blessed? If I’m only living for what’s being reflected back to me, I will suffer when the reflections start to flicker and fade and are finally snuffed out. But if I am living in the light that is radiating from within me, I will be able to live without fear, even as the external world passes through a sextillion sparkling changes. Saved or Not Saved — or Moving Steadily Forward? “Seek and Ye Shall Find” — But What Is Our Part? Where Is the Light that Can Save Us? Asha Nayaswami is spiritual director of Ananda Sangha of Palo Alto, serving the San Francisco Bay Area, including the Peninsula, Silicon Valley, and San Jose. Students around the world receive inspiration and support from Asha’s talks online, posted freely thanks to generous donations from many friends. Asha is a lifelong disciple of Paramhansa Yogananda and a Kriya Yogi. She studied with Swami Kriyananda. A direct disciple of Yogananda since 1948, Kriyananda attained moksha, liberation, in April 2013.